The last person who was born in the 19th century, an Italian woman who is 116 years old, revealed a “secret” to her longevity. Emma Morano’s birthday is Nov. 28, 1899. Her secret is eating two raw eggs and 100 grams, or about 3.5 ounces, of raw steak per day, according to the New York Times. When she was a teenager (back in the 1910s), her doctor suggested that she eat the meal for her anemia, and the habit stuck for the next century. Morano became the world’s oldest person after Susannah Mushatt Jones died Thursday in New York. She was also 116. On Friday, journalists descended onto her home in Morano, Verbania. “I am doing fine—116!” she said. “I finished school and I went to work. I used to sing. I had a beautiful voice,” she said. 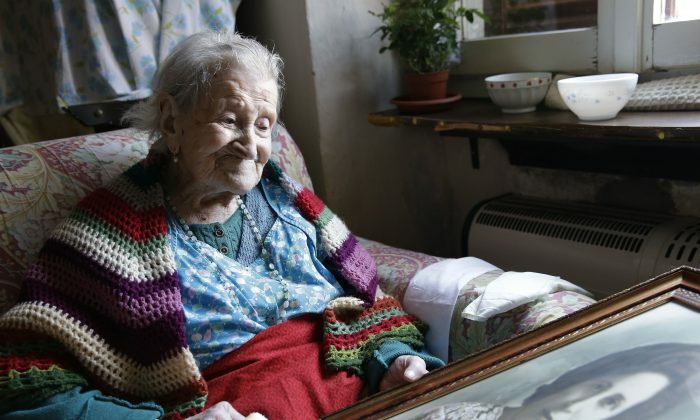 Her physician, Dr. Carlo Bava, said that she was officially the world’s oldest person. One of her carers told the Telegraph she was happy to hear that she is the world’s oldest person. “She was told this morning and she said ‘My word, I’m as old as the hills,’ but she was very pleased,” said Rosi Santoni. “I didn’t want to be dominated by anyone,” Morano said, per Time magazine.